利用 Linux 的 bash script 加上 cron 來自動備份. 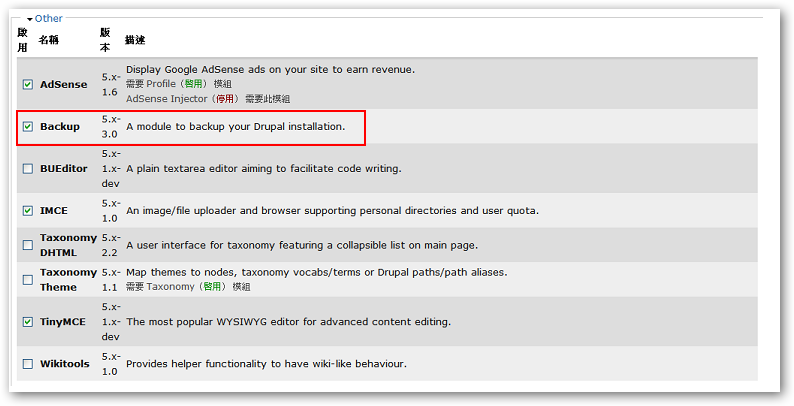 其中的 database 請依你實際的 database 名稱,我的 database 名稱為 drupal. 我們還可以透過 bash script 加上 cron 讓他每天執行一次. #-p[yourpassword] -p 和 [yourpassword] 中間沒有空格. mutt 當然光是備份還不能滿足我們的需求,最好這些資料都能丟到遠端,以防止系統無法開機.這邊提供一個指令 mutt ,這是一個 mail 的指令,比起傳統的指令 mail 他還可以夾檔來傳送你的 mail. %F: full date; 和指定 %Y-%m-%d 一樣. bash 參數: ` `：此符號為數字鍵 1 旁的 ~ 鍵，在` `中的指令優先執行，並將結果套用目前指令. 在他的官方網頁下載 "backup.module" ,放在目錄 /var/www/html/modules/ 下. 在管理中的內容管理會多出一個 "backup" 選項.直接點選就可以開始做 backup 的動作.